Travelport has strengthened its partnership with Australia’s national carrier, Qantas, with a new agreement that includes a commitment to continued collaboration on the future of distribution. Travelport Worldwide has entered into a definitive agreement to be acquired by affiliates of Siris Capital Group and Evergreen Coast Capital in an all-cash transaction valued at approximately $4.4 billion. 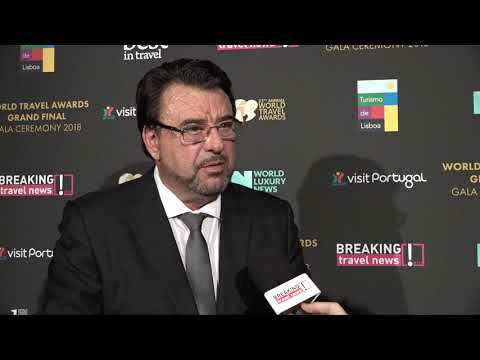 António Loureiro, regional general manager at Travelport, talks to Breaking Travel News as the company is honoured with the title of World’s Leading Travel Distribution Provider during the World Travel Awards Grand Final in Lisbon. Travelport Worldwide has reported a net revenue increased of two per cent for the three months to September 30th, to $623 million. Travelport has become the first global distribution system operator to manage the live booking of flights using the International Air Transport Association’s New Distribution Capability technical standard. easyJet has unveiled a brand-new app feature allowing customers to instantly book flights using just a photo without them even needing to know the destination. Travelport has won a competitive tender process undertaken by Air India for the sole provision of distribution of its domestic flight content in the airline’s home market. Travelport is used by Etihad to arm its sales, marketing, and network planning teams with the information required to respond effectively to industry change, minimise operating costs and increase profits. Under the new agreement, FCM will extend its relationship with Travelport to include the provision of the company’s Universal API technology. Travelport and strategic technology partner IBM have introduced IBM Travel Manager, an AI platform designed to help businesses manage corporate travel spend.